Popeye The Foodie Dog poses with In-N-Out in Alhambra. 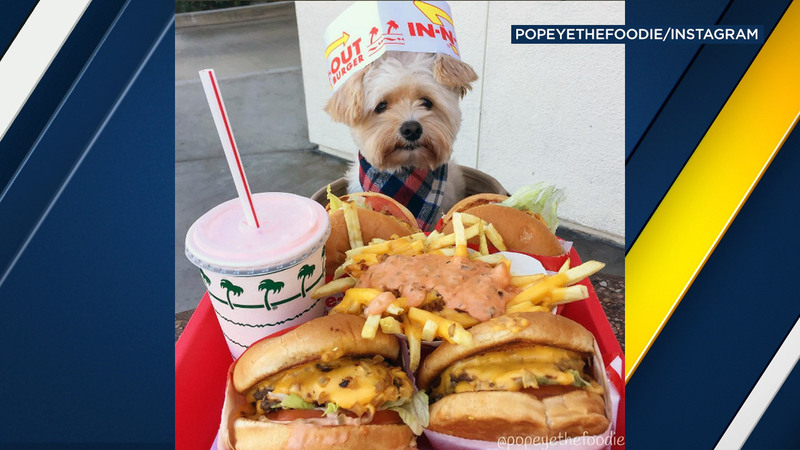 LOS ANGELES -- An adorable rescue dog ordered up some In-N-Out "animal style" in Southern California. Popeye The Foodie Dog has taken social media by storm, amassing more the 92,000 followers on Instagram. The rescue pup and his owner Ivy Diep of Los Angeles seek out pet-friendly dining options and snap photos of him with delicious food. Diep said she got the idea from a friend on their "Instagram dates," where they'd try different restaurants and take pictures of the food. "I would bring Popeye to any of the pet-friendly places, and we realized how good he was around food. He would sit still for photos," Diep told ABC News during an interview. Popeye often dresses up in themes while dining out, wearing hats, dress shirts, sweater vests and even glasses. Popeye recently visited In-N-Out in Alhambra and shared the photo with our sister station in Los Angeles. While Popeye is seen with so much delicious food, Diep said he doesn't actually eat all of it. "We'll give him nibbles of anything that's safe for him," Diep told ABC News. "We always carry a bag of his favorite treats as well. He's usually not really into the food anyway."